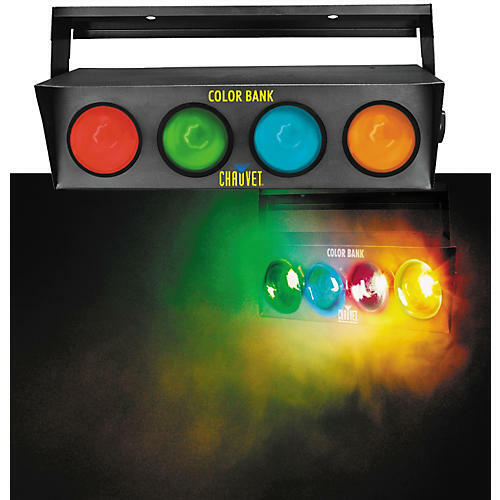 The lightweight Chauvet Color Bank 4-Color Sound-Activated Light offers 4 dazzling colors with fully automatic sound activation, chase, and low power consumption. Uses 4 CHR30 bulbs.Size: 19"W x 11-7/16"H x 14-3/4"D; weight: 6-2/5 lbs. The lightweight Chauvet Color Bank 4-Color Sound-Activated Light offers 4 dazzling colors with fully automatic sound activation, chase, and low power consumption. Uses 4 CHR30 bulbs. Size: 19"W x 11-7/16"H x 14-3/4"D; weight: 6-2/5 lbs.